Apple has come under fire in Australia after consumer watchdog, the Australian Competition and Consumer Commission, accused the company of violating the country's laws by misleadingly calling its new iPad as 4G-capable. In a statement issued today, the ACCC said it will apply to the Federal Court of Melbourne for an order against the Cupertino-based giant and is moving for the court to impose fines and an injunction barring sales. The ACCC says labeling the new tablet as 4G capable is misleading to customers in Australia. Although 4G LTE networks have been deployed in the country, they run on a different band entirely. In Australia, 4G services are provided by Telstra on the 1800MHz frequency band, making them unsuitable for usage with 4G iPad models as the tablet is only capable of using the 700MHz or 2100MHz frequency bands for 4G LTE connectivity. "Consumers who have purchased or are considering purchasing an iPad with WiFi + 4G should ensure that they have a proper understanding of the mobile data networks which this iPad can directly access," the ACCC stated. The Apple store for Australia lists the iPad with the same product naming convention as other stores worldwide, but has chosen to explain the differences in a rather confusing manner underneath the Wi-Fi + 4G pricing. 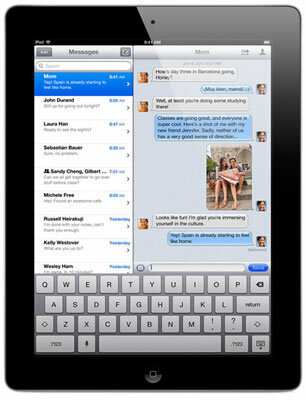 It reads, "the iPad with Wi-Fi + 4G model can roam worldwide on fast GSM/UMTS networks, including HSPA, HSPA+, and DC-HSDPA. When you travel internationally, you can use a micro-SIM card from a local carrier. You can also connect to the 4G LTE networks of AT&T in the U.S. and Bell, Rogers, and Telus in Canada." In the small print at the bottom of the product page, Apple says "4G coverage is not available in all areas and varies by carrier. Please see your carrier for details." While the more technically versed might immediately understand the jargon above, it is understandable that those with less experience could be misled by the words used. Also, there is no specific mention on the Australian store that the new model is incompatible with the country’s only available 4G network. The ACCC’s concern is that the wording leads potential buyers of the new tablet to believe it will connect to the country’s 4G network, but this is not the case. Apple did not respond to requests for further comment on the matter. The full statement by the ACCC is below. The Australian Competition and Consumer Commission will be making an application to the Federal Court in Melbourne tomorrow at 9:30am for orders against Apple Pty Limited and Apple Inc (Apple) for alleged contraventions of the Australian Consumer Law (ACL). The ACCC alleges that Apple's recent promotion of the new "iPad with WiFi + 4G" is misleading because it represents to Australian consumers that the product "iPad with WiFi + 4G" can, with a SIM card, connect to a 4G mobile data network in Australia, when this is not the case. The ACCC alleges that Apple's conduct contravenes sections 18, 29(1)(a), 29(1)(g) and 33 of the ACL. Consumers who have purchased or are considering purchasing an "iPad with WiFi + 4G" should ensure that they have a proper understanding of the mobile data networks which this iPad can directly access by a SIM card.